Denise Gebers/Paulding County Progress Cooper, the newest K9 member of the Paulding County Sheriff’s office, began serving the community Tuesday, July 28 with his handler, Deputy Caleb Miller. The pair recently completed their 14-week training and subsequent certification process. PAULDING – Cooper is on the job! After 14 weeks of training, Paulding County’s second K9 unit, Cooper, and his handler, Deputy Caleb Miller, are on patrol. The pair took to the streets July 28. Caleb describes Cooper as a “dual purpose” dog who is trained in patrol/tracking and narcotics. The team holds certificates from the Ohio Peace Officer Training Academy and the International Police Work Dog Association. 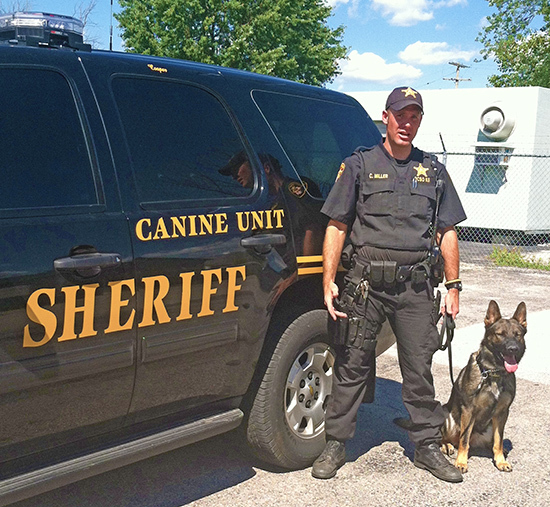 Deputy Miller said he was selected as the office’s second canine handler in March. Shortly thereafter he met Cooper, who is not quite two years old yet, and they began classes in Allen County, Ind. Beginning on April 13, the duo worked Mondays through Fridays on tracking, obedience, aggression, control, narcotics and article searches. Some days were 8 a.m. until 4:30 p.m., while others ran from 3 to 11 p.m., depending on what was being taught. Cooper is able to detect marijuana, methamphetamine, heroin, cocaine, crack and Ecstasy, according to his handler. His tracking abilities are honed at finding articles that may be evidence - phones, keys, weapons, etc. After their July 17 graduation, the pair passed their Ohio state certification on July 21 in Van Wert. Cooper met Jano, the county’s other K9 unit, for the first time on Aug. 1. They will both be part of a demonstration at Antwerp’s Day in the Park this Saturday, Aug. 8 at 1:30 p.m.
Caleb has been with the sheriff’s office full time since June 2013. In addition to being a K9 handler, he is trained to dismantle meth labs, completing that training just before entering the Allen County (Ind.) Police Department K9 School in Fort Wayne. Deputy Miller graduated from the Vantage Police Academy in 2010. During 2011 he took part-time positions with Payne, Antwerp and Oakwood police departments as a patrolman. Shortly after that he began dispatching on a part-time basis at the sheriff’s office and joined the reserve units there. He also worked in the jail when called upon to do so. A Paulding County native, Caleb graduated from Paulding High School and from University of Northwestern Ohio, Lima. Mars Pet Care, formerly IAMS, out of Leipsic has continued their commitment to feed Paulding County’s K9 units by donating their food.